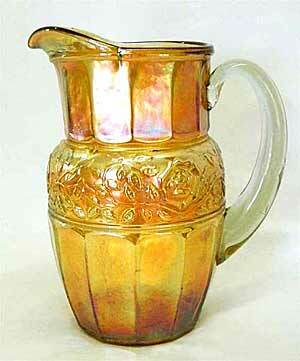 This water pitcher (left) in marigold sold in 2013 for $290. It is marked “Piccardo” on the base. Photo courtesy of Seeck Auctions. Two 3 1/2 inch cordials (such as the one on the right) listed as Band of Roses sold in 2012–for $110 and $210. 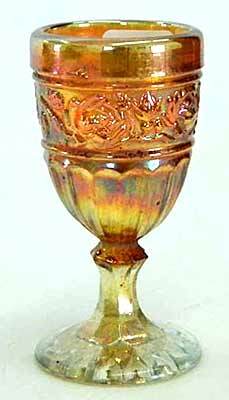 Band of Roses was made by the Argentine glass maker Cristolerias Piccardo. Note that the pattern (and name) is similar to the made by Brockwitz of Germany. It is possible that some of the pieces below pieces may actually be the Rose Band pattern.